Your guests will definitely want to make sure they're thinking outside the box at your big Halloween costume party when you announce that you'll be giving an award for the most original costume! 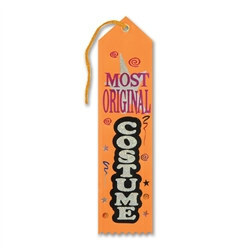 The Most Original Costume Halloween Ribbon is a great way to encourage some friendly competition at your party and makes a great memento for guests to hold on to. This award ribbon truly does feel like a prize with it's serrated bottom edge and pointed top. The Most Original Costume Halloween Ribbon displays the festive colors of Halloween with it's vivid orange background and silver, black, and hot pink metallic lettering. This ribbon hangs on a golden loop, so it can be proudly hung up and displayed for many years to come. Don't forget some of our other Halloween costume awards, like the Scariest Costume Halloween Ribbon and the Sexiest Costume Halloween Ribbon!